Significantly lighter and cheaper than an iPad, but is that enough? The Nook HD+ is a well constructed tablet with a fine screen and an appreciable weight advantage over its rivals. It may not look the prettiest, but we'd back it to go a year or two without picking up any noticeable bumps or nicks. With the Nook HD, US bookstore giant Barnes & Noble entered the wide-open 7-inch tablet market, but with the 9-inch Nook HD+ it faces a single and much more daunting foe. The full-sized tablet market continues to be thoroughly dominated by the device that defined it - Apple's peerless iPad. When even Google and its technically impressive Nexus 10 can't make an impression at retail, what hope does the Nook HD+ have? With a super-sharp 9-inch display, a slim and lightweight body, and a £229/US$269 full price tag for the 16GB version - or £269/US$299 for the 32GB model - Barnes & Noble certainly has some notable bullet-points to put on the box. But does the user experience match the raw specs? In that respect it needs to learn a few lessons from close rival the Amazon Kindle Fire HD 8.9, which got the price and performance just about right, but failed as a full-fat tablet experience. 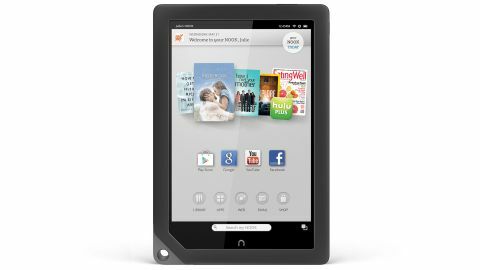 The Nook HD+ wins instant points for its unique design. While you'd struggle to pick an Amazon Kindle Fire HD from a lineup of budget tablets, here we have a device that sports a couple of key visual flourishes. Chief among these is the large hole-grip situated on the bottom left-hand corner of the tablet (in portrait view). It might be there to hook a lanyard through, but it also serves as a handy thumb-grip when handling the device, enabling you to get real purchase on it with a single hand. Yes, unlike the iPad, this is a full-fat tablet that's light enough to hold in one hand - at least for brief periods. At just 510g (18oz), the Nook HD+ is almost 140g (5oz) lighter than the iPad 4. That's roughly the weight of an HTC One shorn from its body. This has been achieved, inevitably, through the heavy (or should that be light?) use of plastics, though that's not to say the Nook HD+ feels especially cheap. It's no iPad mini on the premium components scale, but it feels fairly firm in the hand. We did get some disconcerting flexing and creaking when we applied a little two-handed pressure, but in general usage it's a reasonably solid construction. One slight negative from an aesthetic point of view is that typical bulging Nook bezel, which provides a raised ridge around the screen. With the aforementioned corner grip sitting flush with the screen, it makes the Nook HD+ look a little like a skinnier tablet that's been slid into some kind of protective bumper. Still, the thick border aids handling, and will doubtless provide protection should you put the device down screen-first when in a hurry (shame on you). Around the back, the Nook HD+ has a pleasingly tactile matt finish that reminds us of the Kindle Fire HD range. Curiously, there's only one speaker grille here compared to the dual setup of the smaller Nook HD. In terms of hardware buttons, the Nook HD+ benefits from a physical home key on the front, although the tiny n-shape doesn't feel as reassuringly clicky as Apple's iPad equivalent. But then, it only has two simple functions to fulfill - to wake the device up and to return you to the home screen. The other physical keys are even more vague, with the power button situated at the top of the right-hand side (again when held in portrait view), and the volume rocker just around the corner on the top edge, with a 3.5mm jack alongside. These hardware keys are small and non-descript, and it takes a while until you can reliably hit them without having to look or feel around the edges. One component that definitely punches above the Nook HD+'s weight is its 9-inch display. With a resolution of 1920 x 1280, it's virtually as sharp as the latest iPad's Retina display, and it's also remarkably clear. If you're used to the colder, bluish tinge of the iPad, you might find the tone of the display a little yellowish, but it makes for an easier text-reading experience (Nooks are, after all, ebook readers above all else) and isn't as pronounced as, say, the Amazon Kindle Fire HD 7.0. Finally, along the bottom of the device we have a proprietary 30-pin port rather than a universal micro USB port. If like us you love the fact that you can lug a single charger around for your Android tablet, Android phone and point-and-shoot camera, you'll find this particularly annoying. There is some good news to be found along the bottom edge of the Nook HD+ though, in the shape of a microSD slot. Yes, unlike the Amazon Kindle Fire HD 8.9 and the iPad, you can expand the Nook's memory by up to 64GB relatively cheaply. All in all, the Nook HD+ is a well constructed tablet with a fine screen and an appreciable weight advantage over its rivals. It may not look the prettiest, but we'd back it to go a year or two without picking up any noticeable bumps or nicks, which is more than can be said for any iPad we've owned.